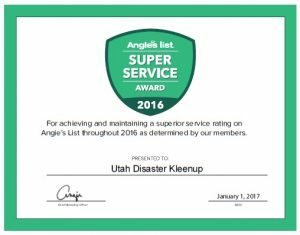 (Draper., Utah, Feb. 27, 2017) – Utah Disaster Kleenup (UDK), a member company of DKI, North America’s largest disaster restoration contracting organization, proudly announced they received Angie’s List’s “Super Service Award” for 2016. This is the third consecutive year UDK has earned this award for Salt Lake’s leading Water and Fire Damage Clean Up and Restoration Company, representing their consistently high-level customer service to members of Angie’s List, a local services marketplace and consumer review site. “UDK is proud to have the Angie’s List members once again speak out on behalf of our services, and we are very proud to win this award for the third year in a row,” said Keri Jones, director of sales and marketing for UDK. The Super Service Award is the highest honor given annually to the top five percent of qualifying businesses on Angie’s List. The winners are determined by consumer reviews and ratings, updated daily. They must meet strict eligibility requirements, including being in good standing with Angie’s List, passing a background check, abiding by Angie’s List operational guidelines and scoring an “A” rating, based on price, professionalism and punctuality. “Companies that can meet [these] higher demands without missing a beat in their exemplary performance standards truly do stand apart from their peers. Only a fraction of the water and fire damage clean up and restoration companies in Salt Lake were able to do it,” said Angie’s List Founder Angie Hicks. UDK is the largest disaster and restoration service company in Utah, offering 24/7 emergency residential and commercial response. Their advanced restoration technology, equipment, and facilities provide them with the resources needed to restore a customer’s property, so the customer can re-establish normalcy in their life. The central location allows for an immediate response time. UDK can reach you quickly, and start work fast. To learn more, visit www.calludk.com.